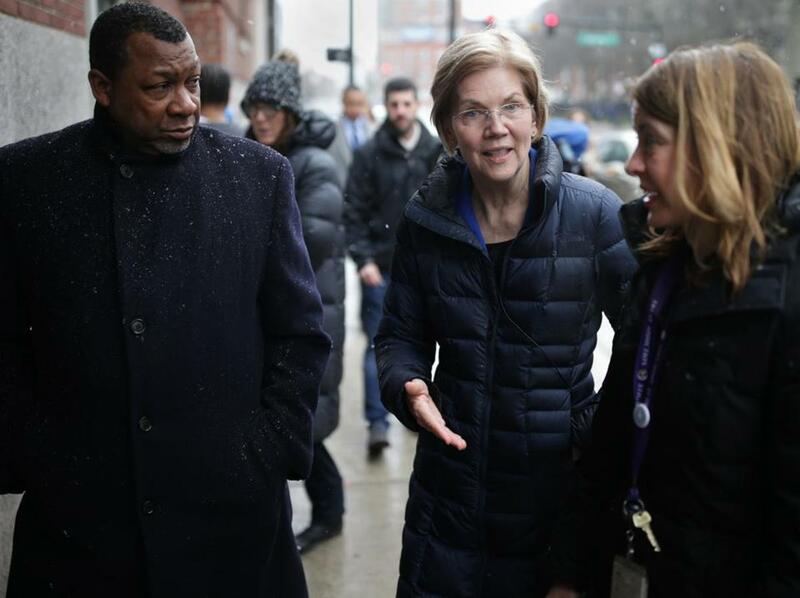 From left: Suffolk County Sheriff Steven W. Tompkins with Senator Elizabeth Warren and Dr. Jessie Gaeta in the South End. The legislation is built on a massive $100 billion commitment over 10 years, with funds funneled directly to states and individual centers that treat those fighting substance abuse. The Cambridge Democrat is filing the bill with US Representative Elijah Cummings, a Maryland Democrat, and is still compiling co-sponsors. Federal lawmakers have shown a willingness to tackle opioids, but the bill would be just one of several proposals already on the US Senate’s radar. In the last month alone, no fewer than three other bipartisan bills have surfaced, in addition to a spending bill that passed last month and commits $4 billion in federal funds to help states. The US Senate Health Committee, too, released its own draft of a bill this week. Similar to how the 1990 Ryan White CARE Act sent money directly to areas hardest hit, Warren’s aides said her bill is designed to funnel more funds to states and cities with both the highest overdose rates and the most in raw numbers. The focus on the impact of fighting HIV comes as officials fear the opioid epidemic could be driving a new surge in the disease. State officials said this week that the US government will dispatch disease-trackers to Massachusetts to investigate a puzzling cluster of new HIV infections among people who inject drugs in Lawrence and Lowell, where 52 new HIV cases were reported last year. At the Boston Health Care for the Homeless Program, officials say they’ve seen the worst of both fights, and the impact an infusion of federal cash had on helping stem the spread of HIV and AIDS. Jessie Gaeta, the agency’s chief medical officer, said overdoses have become “far and away the leading cause of death of our patients.” They see a new one every day in the clinic, she said, including one just an hour before Warren and a gaggle of reporters arrived for her press conference. “We are drowning,” she said. Reach Matt Stout at matt.stout@ globe.com.